Harvey Shapiro at the 2010 Key West Literary Seminar. Photo by Sharon McGauley. Harvey Shapiro (1924-2013) was an admired poet and editor of both the New York Times Book Review and the New York Times Magazine. 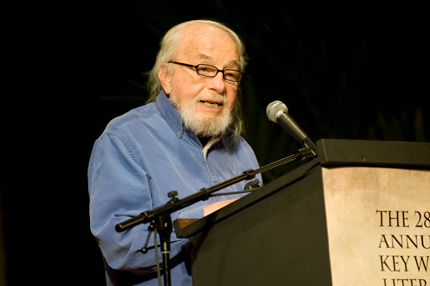 As an editor with the Times, he is credited with having suggested that Dr. Martin Luther King write his landmark document “Letter from Birmingham Jail.” As a poet, Shapiro authored twelve books, including The Eye (1953), This World (1971), and The Sights Along the Harbor: New and Selected Poems (2006). From KWLS 2010: Clearing the Sill of the World.This recording is available for noncommercial and educational use only. All rights belong to the author and/or his estate. © Harvey Shapiro. Used with permission from Harvey Shapiro.